Peru’s Interior Minister Mauro Medina issued a statement Thursday vowing “appropriate measures” after a selfie of conservative Popular Force party leader Keiko Fujimori in the back of a police car began making the rounds on social media. A Peruvian judge ordered Fujimori’s preemptive arrest on charges of money laundering and corruption tied to the Brazilian contracting firm Odebrecht, arguing that she was a “great flight risk” and should not receive bail. Fujimori’s attorney’s argued that imprisoning her without a conviction or public proof of criminal activity was a violation of her rights. 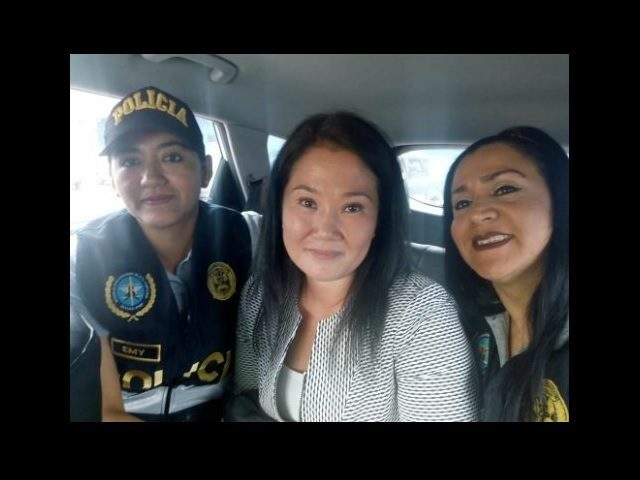 Adding to accusations that the longtime right-wing lawmaker’s rights were in jeopardy thanks to the arrest, a photo surfaced on social media on Thursday that appeared to show Keiko Fujimori wearing a forced smile in a selfie taken by two female police officers. Speculation on social media suggested the photo may have been doctored or illegitimate. Interior Minister Medina issued a statement appearing to confirm that the photo was real, however, and promising an appropriate disciplinary response. Keiko Fujimori has remained the leader of the most prominent anti-leftist force in the country for years, leading a successful first-round presidential campaign in 2016 but ultimately losing in the run-off election to Pedro Pablo Kuczynski. In addition to campaigning against concerns that her politics were too similar to her father, former president Alberto Fujimori, the younger Fujimori faced discrimination for her Japanese background, in one instance being referred to by a senior Kuczynski adviser as a “Chinawoman” whose eyes were “too small” to read good policies. Keiko Fujimori has been the target of corruption rumors for years, however, in particular, accused of having ties to the Brazilian contractor Odebrecht, which used political bribes to ensure contracts with governments throughout the continent. The Peruvian newspaper La República noted this week that rumors of Popular Force taking illegal Odebrecht money go back to 2011, when the publication revealed evidence suggesting a raffle organized by the party served to launder up to $1 million in Odebrecht donations. The Odebrecht scandal has resulted in the arrest of dozens of politicians of all ideological stripes in Brazil and has taken down at least two presidents in Peru: Kuczynski, who resigned amid allegations of taking money from Odebrecht, and imprisoned leftist former head of state Ollanta Humala. On Wednesday, officials arrested Keiko Fujimori on charges of having used the Popular Force party’s treasury to launder Odebrecht money. Fujimori’s attorneys are appealing her preliminary detention, arguing that she is not a flight risk. Fujimori herself wrote a handwritten letter to supporters published on her Twitter page on Wednesday. The arrest on Wednesday came at a sensitive time for the Fujimori family. Last week, the nation’s Supreme Court overturned a pardon issued to the elder Fujimori for alleged human rights crimes during his tenure. Fujimori received the pardon, revoking a 25-year prison sentence, on humanitarian grounds, as the octogenarian suffered from a heart condition and other sensitive health problems. Keiko Fujimori’s arrest represents a significant blow to Peru’s strongest conservative party following a year in which Popular Force successfully forced then-president Pedro Pablo Kuczynski to resign with the publication of videos appearing to show his government attempting to bribe former Popular Force lawmaker Kenji Fujimori, Keiko’s younger brother. The videos surfaced shortly after evidence tying Kuczynski to Odebrecht. The matriarch of the Fujimori family, Alberto’s ex-wife Susana Higuchi, ran for president against him in 1995. Keiko served as her father’s first lady.